Lindsay Lohan flaunts her movie star stems in YSL Tribute sandals. Rihanna hints at her 20-foot performance to come in white (after Labor Day, oooh!) t-bar platforms. Lauren Conrad's silver Sergio Rossi slippers seem to hover above the carpet thanks to their lipstick heels. Ashley Tisdale's barely there silver sandals are the perfect compliment to her shimmery Cavalli mini. Ciara tantalizes with toe cleavage in her stacked Louboutins on the 2008 VMA Red Carpet. Heidi Montag is ready for the hills of eastern Europe in her studded 'Babouska' booties by Gucci. Solange Knowles' strappy ribboned platforms sing along with her patent Fendi clutch. 'American Idol' Jordin Sparks carries her Betsey Johnson sparkler on a pair of patent platforms. Tara Conner intimidates the competition in stunning Chloe Peep-toe Leather Shoe Boots. Paramore's Hayley Williams wears her devil-may-care, riot girl attitude on her sleeve... And her feet. Stephanie Pratt matches her floral slingbacks to her clutch, spicing up her little black dress with a taste of red. 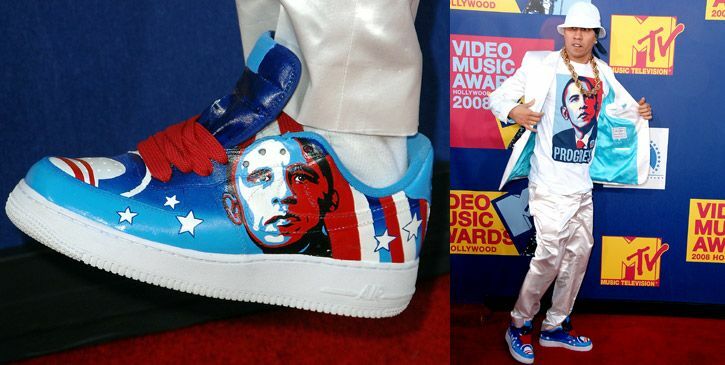 Black Eyed Peas MC Taboo puts his Nike AIRs to work, turning them into billboards for Barack Obama.